This week our knitting group met at the beer garden where the pretzels are bigger than our heads. Other than being infamous, our beer garden has surprisingly excellent lighting and nice long tables for us to share. 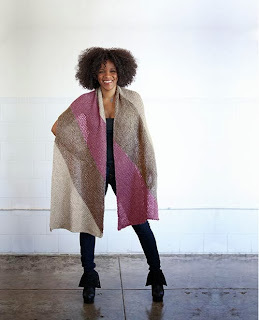 Leslie showed off her cozy cushy color block bias wrap. I am in love with the soft and light feel of the Classic Elite MountainTop Chalet and on size 13 needles, Leslie said it flew. I have not yet seen “Catching Fire,” but the cowl-ish thing Katniss wears is making knitters swoon. Over at LollyKnits, —- has kindly created her version and made it available for free! You can get it from ravelry here. She’s got that fierce look down, doesn’t she. You probably know, but in case you don’t the Yarn Harlot is doing her gift guide for knitters again this year. Always a great place to discover new and cool things for knitters. I am so glad this old place found the right magic to keep in business and attract you young kids!